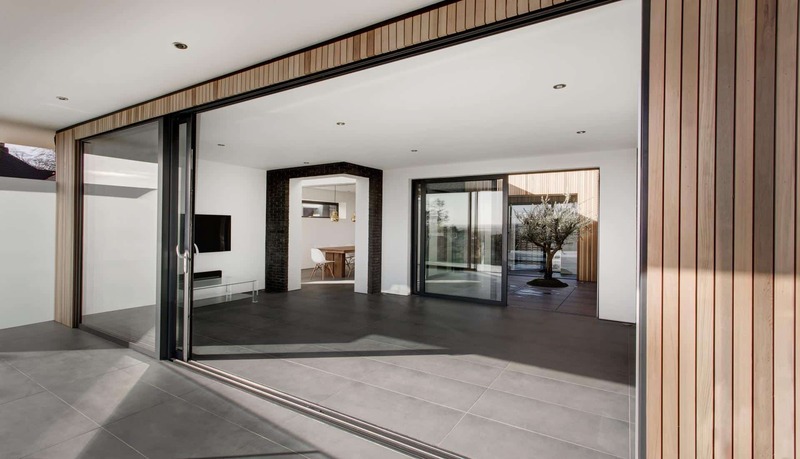 Over recent years Sliding doors have fallen victim to the popularity of the bifold, but now, aluminium sliding doors are enjoying a surge in popularity. One of the reasons for this is the latest generation of slimline sliding doors. What are slimline sliding doors? Latest generation sliding doors are thinner, bigger and more attractive than ever before. Modern aluminium sliding doors are quite different in their design from the standard patio door you will be familiar with. One of the first innovations is multi-tracks, enabling many sliding doors to be designed to slide in one direction or both directions. The frame design of sliding doors is also quite different giving your home much thinner doors than ever before. Working with a builder, it is even possible to hide the sliding door frames into your new walls giving a virtually frameless appearance. Finally, the interlock on new aluminium doors has slimmed down to provide sight lines as narrow as 35mm, over 60% thinner than regular sliding doors. The interlock is one of the features that denotes a slimline sliding patio door. These ultra small interlocks make for a visually appealing product that reduces bulk and makes for impressive views out through the large glass panels. Understanding slimline sliding doors terminology. As you do your research around sliding doors, there are several terms you may come across. We explain some of these. The head and jambs are the goalpost frame housing the sliding panels. This is the bottom of the door frame that the sliding panels sit on with their rollers. The cill and track take all the weight of the doors and can be adjusted to provide a standard or level threshold arrangement. These are the glazed door panels that slide on the track to the left or the right. The interlock is the central mullion or mullions that are visible when the sliding doors are closed. The backs of the sliding doors meet on each vertical side, lock together and provide the vertical mullion you see. It is the interlock that is one of the key components of slimline sliding patio doors. Northwest Bifolds. Your Liverpool sliding door experts. At Northwest Bifolds, we specialise in the latest range of aluminium patio doors, whether you are looking for a simple two panel door or a large panoramic sliding door. We offer a range of sliding doors from the best known brands in the UK such as Reynaers, AluK and Origin. The new AluK Optio BSC94 sliding door is our latest product that offers a choice of aesthetic. You can choose from either the standard 85mm interlock or a slimline 45mm option. We can also provide the latest panoramic sliding doors designed to create sliding glass walls and provide a near frameless appearance and even a moveable corner post. Expert sliding door manufacturers specially make all our doors and we install every door with our expert trained installers. Contact us today to find out more about our latest range of aluminium slimline sliding doors ideal for your new extension or home improvement project.